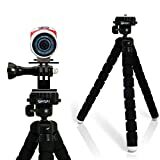 iGadgitz Large mini tripod with 1/4 inch screw thread and mount for attaching TomTom Bandit action video cameras. 3 Flexible legs allow you to secure your action camera almost anywhere providing a range of shooting angles. Rubber feet for stable positioning. Compact, lightweight and folds up for easy storage. Only 26cm in height. Can support maximum weight of 880g. Perfect for both amateur and professional photographers and videographers. PLEASE NOTE: THIS PRODUCT DOES NOT INCLUDE A TOMTOM ADAPTER. ADAPTER IS REQUIRED FOR THIS ITEM. The iGadgitz large flexible mini tripod lets you position your Action Camera almost anywhere to help you capture the perfect shot. Completely flexible and versatile, attaching the mount to your camera and the tripod is simple, and you can be ready to shoot a movie in seconds. Rubber feet grips provide enhanced stability on uneven surfaces. The tripod fits easily in your camera bag without adding noticeable weight – it weighs just 158g with height of 26cm only. Also use the tripod for other digital cameras using the 1/4 inch screw thread, up to a maximum of 880g. The mount is compatible with other accessories like selfie sticks and monopods with 1/4″ screw threads. Whether you’re taking a video or shot of you and your friends whilst out and about, or lining up the next landscape, you’ll be happy you have this handy little tripod and mount close at hand.